What is a sparse file and why do we need it? The only thing that I am able to get is that it is a very large file and it is efficient(in gigabytes). How is it efficient ? This is why a sparse file is efficient, because it does not store the zeros on disk, instead it holds enough data describing the zeros that will be generated. Note: the logical file size is greater than the physical file size for sparse files. This is because we have not stored the zeros physically on a storage device. You can see that this file has 8388616 blocks allocated to it, these blocks store nothing but empty bytes copied from /dev/zero and they do occupy physical disk space, they're holes stored on disk (sparse zeros). dd did what you asked for, copying blocks of data from one file to another. Do you notice something? The the number of blocks now is 0 because the blocks that were storing only empty bytes were de-allocated. Remember, output's blocks store nothing, only a bunch of empty zeros, fallocate -d detected the blocks that contain only empty zeros and deallocated them, since all the blocks for this file contain zeros, they were all de-allocated. Also notice how the size remained the same. This is the logical (virtual) size of the file, not its size on disk. It's crucial to know that output doesn't occupy physical storage space now, it has 0 blocks allocated to it and thus I doesn't really use disk space. The size preserved after running fallocate -d so when you later read from the file, you get the empty bytes generated to you by the filesystem at runtime. The physical size of output however, is zero, it uses no data blocks. Remember, when you read output file the empty bytes are generated by the filesystem at runtime dynamically, they're not really physically stored on disk, and the file's size as reported by stat is the logical size, and the physical size is zero for output. In this case the filesystem has to generate 4G of empty bytes when a process reads the file. GNU dd internally uses lseek and ftruncate, so check truncate(2) and lseek(2). A sparse file is a file that is mostly empty, i.e. it contains large blocks of bytes whose value is 0 (zero). 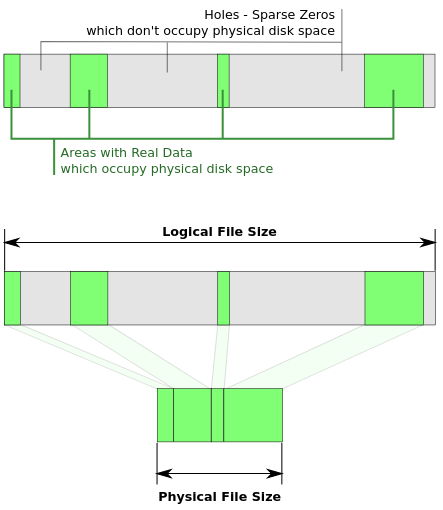 On the disk, the content of a file is stored in blocks of fixed size (usually 4 KiB or more). When all the bytes contained in such a block are 0, a file system that implements sparse files does not store the block on disk, instead it keeps the information somewhere in the file meta-data. writing an empty block of data into a sparse file does not take time; on writing, the file system detects that the block is empty (all its bytes are 0) and puts the block ID into the list of empty blocks (in the file meta-data); no data is written to the disk. More information about sparse files can be found on the Wikipedia page. Not the answer you're looking for? Browse other questions tagged file filesystems system disk sparse-file or ask your own question. Why is numpy.memmap initialization so fast? How to create a link to a file stored in internet / cloud but appears as a 'local file' in Windows Explorer?